The New England by election went more or less as predicted with Barnaby Joyce receiving over 65% of the primary vote, and we have 9 days until the Bennelong by election. In between, I'd like to take a slightly irregular look at another, off-brand event(?) in progress(?) in the same spirit as previous examinations of non-political(?) votes. Basically, I have been spending way too many hours recently binge-watching a gigaton of YouTube videos, and yesterday saw the release of YouTube rewind, an annual, borderline-epilepsy-inducing montage of prominent YouTubers, this year with fidget spinners and a rendition of Despacito. The thing is, this year has been a pretty bad for YouTube from the perspective of many creators and viewers, from the 'adpocalypse' where videos were demon(it)ised for being 'controversial' (sometimes by simply containing LGBTIQA+ material, covering politics etc.) to technical issues to flagrantly inappropriate content sneaking onto the site's supposedly child-friendly platform YouTube Kids. Throughout it all, rightly or wrongly, YouTube management has been viewed as acting unprofessionally and yielding too much power to advertisers. Although, with the exception of the limited success of YouTube Red, advertisers pretty well carry the YouTube platform many appear to seem merit in the criticisms of the website's management. In retaliation, YouTuber EmpLemon proposed a deliberate effort to embarrass YouTube with poor ratings on their YouTube rewind video to counter what he sees as a publicity-driven, reactionary mindset where the YouTube donkey kicks the creators behind it in a knee-jerk reaction. His thorough list of reasons and call to arms can be found here (strong language warning), spawning the hashtag #TankTheRewind. Although that video has only 36 thousand views at the time of writing (I did say I watched a gigaton of videos before that came up), other some other YouTubers have spread the idea to their fanbases. Responses to the idea on reddit and 4chan have generally been positive but very scarce. Steam has been less on-board. After the internet-wide movement to stand up to the US FCC's attempts at removing net neutrality in the United States and the band-wagoning that made EA's justification of certain features in their game StarWars: Battlefront II the least popular reddit post in history, the response thus far must be underwhelming for the #TankTheRewind supporters. On the other hand, these recent movements have shown that the internet can mobilise when outraged, so perhaps time will tell a different story. After roughly one day, the rewind video has received 26,382,332 million views. This seems like a fair sample-size, but given the infancy of #TankTheRewind may be unrepresentative. At present, there are 1,184,149 thumbs-up and 502,380 thumbs down, roughly a 2:1 split, which isn't great for an uncontroversial video. (By the way, accurate vote totals are available by hovering over the blue:grey ratio bar beneath the thumbs). Then again, a corporate entity producing a video while trying to join several long-since-abandoned trends may get a lot of down-votes for being #cringe. (Yeah, I'm #downwiththekids, #hip, #relatable, #psephologyiscool). So a few things stand out. Firstly, we may be looking at only 10% of the votes counted despite over 26 million views this year. Secondly, there is a downturn in approval (thumbs up/thumps up+down x 100%) but this is can easily change, and is not inconsistent with a general trend of lower approval since 2014. Perhaps people are fed-up with the rewind series, or having it thrust upon them. Thirdly, 2011 was an anomaly. It could be because 2010 was the first attempt at a rewind and people were less receptive. Or it could be because Rebecca Black was hosting it. 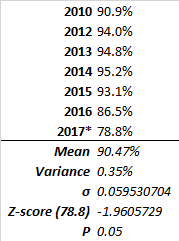 Fourthly, for #TankTheRewind to claim any sort of victory, we need to be looking at approval figures in the low 80% range or it's indistinguishable from 2016. 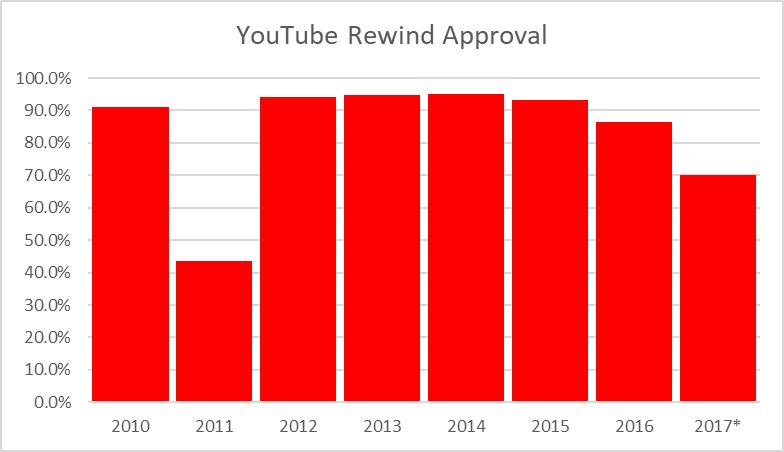 So far, Rewind 2017 is on track to be statistically significantly worse than previous years excluding 2011. Debate as to how important #TankTheRewind was, however, remains to be held.